UPDATE Oct. 12: Student Health Services, in conjunction with the School of Nursing, will host a flu shot clinic Oct. 18. The clinic will be held at Student Health Services from 9:30 a.m. to noon and 1 to 3:30 p.m. and will be open to SF State students, faculty and staff. Flu shots will cost $25, which will be charged to University Bursar accounts. Just as the fall and winter seasons approach, SF State students, staff and faculty lined up for their annual flu shot this afternoon. Student Health Services partnered with Walgreens to provide free flu vaccinations to the first 200 patrons. “The vaccination helps prevent the spread of the flu on campus,” said 18-year-old business marketing major Julia Shuman, who greeted interested SF State students and staff. “It’s important to try and stay healthy,” said 25-year-old nursing graduate Carly Munekiyo. Munekyio has been getting flu vaccinations the past four years because of her nursing major. She also plans to apply for jobs in the medical industry, which requires mandatory flu vaccinations. The waiting room was crowded with almost every seat taken. According to students, people waited for more than an hour to receive the flu shot. The clinic attracted a lot of people because it was free and on campus. “It was convenient. I had seen the free clinic when I was passing by and had no class,” said 23-year-old marketing major Rosezelda Pratt. 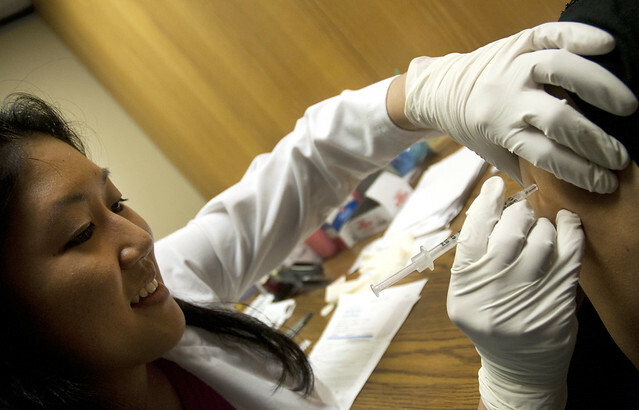 Student Health Services offer immunizations every Wednesday from 10 a.m. to 1 p.m. Flu vaccinations will be available for $25 this semester.